Reach employees no matter which device they are using. SnapComms Mobile is the secure mobile employee messaging tool for the enterprise. Stop notifications on other devices once they’ve acknowledged it on one. Example 1: Reach Store Managers of a Large Grocery Chain during an outage. 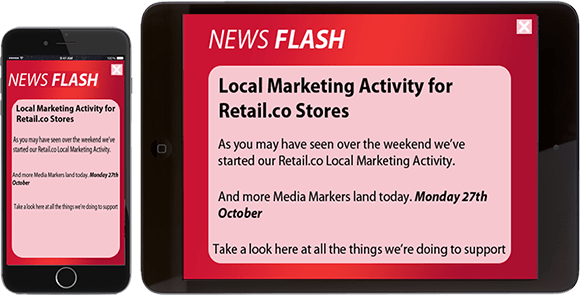 Due to a credit card processing outage affecting dozens of stores, the corporate needed to get instructions out immediately to all Store Managers. With email it could be days before the message is read, and with SMS, there is no way to know if employees saw the message and took action. SnapComms Alerts reach targeted employee audiences wherever they are - on the PC, on the phone or on the tablet with critical information. Once the message is acknowledged, notifications stop. Employees are in the loop and know what they need to do. Employees get in the loop sooner. Action happens faster. Important communications - For important notifications, messages can be delivered with mobile push notification and messages can be repeated on all devices until they have been read or acknowledged on one device. Message acknowledgement options - For compliance and policy communications, message acknowledgment buttons can be added to mobile messaging formats. Message reporting - The SnapComms platform provides full reporting on message readership as well as collects and collates ; quiz, survey and RSVP responses. Role and location specific targeting - The SnapComms messaging platform allows message administrators to target messages by role or (in some instances) location. Scheduling and expiry of messages - The mobile employee communications platform allows message scheduling and expiry dates and times to be specified for each message. Thus ensuring that out-of-date messages do not overload employees. Quiz, Survey, RSVP and Video formats - The mobile employee communications platform allows visual alerts, quizzes, surveys, RSVP invites and video to be delivered to employees' mobile devices. Increase views and convenience - Deliver internal videos (e.g. training or internal communication updates) for staff to watch during commutes / while they exercise / at their convenience. (*) if supported by the device. Build product knowledge and boost morale with mobile quizzes. 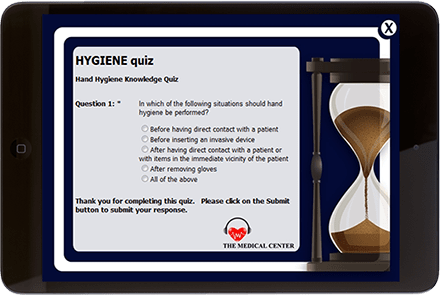 Quizzes can be branded and themed to suit specific purposes.